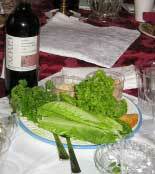 The following photos, instructions and information are provided as a supplement to the Seder Preparation Checklist. You do not need to do just as we have. These are provided as a suggestion and as a spark for your creativity. 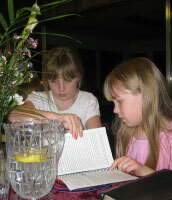 Over the years, we’ve planned and hosted large community-type seders as well as small (and not so small) home seders. Our favorites have been the smaller, more intimate ones in homes, but both involve much planning and preparation for this special night. We hope that these resources are of help to you. Start early, give yourself more time than you think you need... and relax! May you have a joyous and meaningful Passover and Feast of Unleavened Bread! 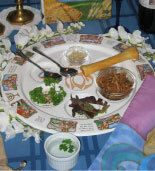 Here are three examples of a prepared seder plate. The top photo (close up) is a large seder plate with small portions. The lower photo is a smaller seder plate to serve more people. As you can see, it is up to you. 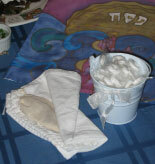 The smaller bowls on the seder plate hold the horseradish and charoset. The bowls with parsley floating in them (lower part of both photos next to the seder plate) is the bowl of salt water. In the 2nd photo at the back is a white square Matzo Tosh. We made these out of a washable brocade bridal fabric for the top and a nice cotton broadcloth for the 3 sections (pockets). Below are quick instructions. 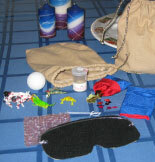 We hope to follow up at a quieter time with close up photos and pattern drawings. •Measure your matzah and make it large enough to easily take the matzot in and out (remember to allow for seams). •Cut 4 pieces of the broadcloth fabric to your finished size plus seam allowances. Plan to use the selvage for the “outside” edge of the openings as this creates a finished edge. 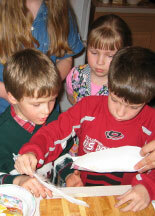 •Cut your cover fabric the same width, but at least 1/2" longer. Create a lining for the cover by sewing one end of a shorter edge (right sides together) to one of the broadcloth pieces. This seam will be at the opening of the Matzo Tosh. The cover fabric will be slightly larger and hide the opening when sitting on your seder table and it will have a nice finished hem that folds under where joined to the lining (much like a suit jacket sleeve hem). •Place right side of cover to 3 broadcloth pieces (selvages on edge to be left open). Sew 2 sides and bottom together, leaving top open for matzah. Finish seams to your preference. Turn right side out and press lightly. We use a small flashlight instead of a traditional candle because the wax hurts when it drips onto your hand, not to mention how difficult it can be to get out of the carpet! 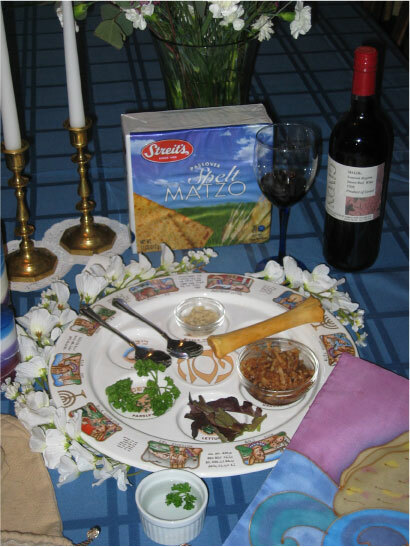 “Bedikat Chametz Kits” can be purchased from your local Judaica supplier or on-line. It comes in an envelope with the wooden spoon, feather, and candle and costs around $1.95. The chametz is disposed of in the envelope and sealed. It is either thrown into a fire that is lit (woodstove or fireplace) or it is put outside the back door if we're at a rented facility without a fireplace. This is the matzah that is broken off, hidden, then later found for a prize. Nile turns to blood: These are reversible fabric bags made of a moire found in the bridal section. They look like blue water on the outside and when turned inside-out, they are red and 3-D confetti fish fall out. Frogs: A plastic frog. We now use one that hops across the table when you push on its back side. Both are fun because kids will just make any frog hop... usually all over the man who volunteered to be Pharoah. Lice: White rice in a clear plastic film container (harder to find these days) with “lice” warning labels printed on a home printer. Insects: Large plastic fly from a party supply store. These are very easy to find near the end of October. Jewish tradition says these are wild beasts (and these plastic flys are probably big enough to qualify!). You can substitute plastic jungle animals for the flys if you desire. Disease on animals: Plastic kosher farm animals with red nail polish dots painted on them. Purchased in toy section of general merchandise store (Fred Meyers). Boils: Plastic bubble wrap. Pink is nice because it looks more like skin. Clear is available in most mailing/office supply stores or departments. Hail: Plastic practice golf balls from sporting goods section (Wal-Mart). They are like a ping pong ball with dimples. A ping pong ball would work also. Locusts: Plastic grasshoppers and locusts from party supply store. Darkness: The darkness is so thick it was felt, so these are made from thin cardboard or cardstock and fabric felt is glued to the inside (worn against the face). Silver elastic string tied into punched holes hold it on your head. 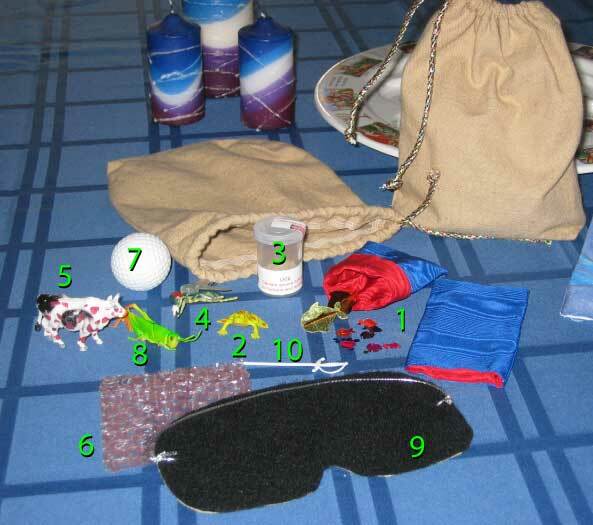 You may be able to find pre-made party masks and simply glue felt to the inside and save yourself some time. Death of Firstborn: Plastic drink sword (made to hold fruit in a drink). We found these at the party supply store, but we've seen them at larger grocery stores and suppliers such as Cash and Carry. We let the kids play with these for the remainder of the Seder and collect them back at the end. Often children will ask if they can take them home. 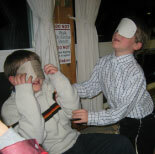 We respond that they can enjoy them next year at the Seder and this keeps them special for Pesach. It also keep you from having to make them every year! Those are 10-gal Rubbermaid tubs in these photos, which do double duty for storage and transport of our Pesach towels and decorations. 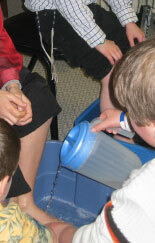 Another option we've done is to ask everyone to bring their own footwashing bowls and towels for their personal use. The men and women are in separate areas for this for modesty purposes. The warm water is poured over the feet, which are not in the water, just hanging over the water. We use Dr. Bonner's travel-size liquid peppermint or almond soaps as they are easy to handle and pour from, and the lid easily snaps closed. Typically the footwasher will pray over the person whose feet they are washing. 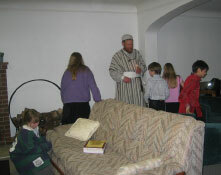 Adults instruct the children (who, of course, prefer to wash another child’s feet or their mom or dad’s feet). As this is new to many folks and some tend to be anxious about their feet, we instruct that each person chooses for themselves if they want to participate in the footwashing. Even those who are unsure or shy have told us that this was a meaningful part of the seder and they are glad they participated. Expect that many, if not all, will remain barefooted the rest of the night. The napkin shown in this photo is presented using “The Rose” napkin fold with a chocolate mint placed in the center. Instructions for folding napkins in a variety of nice presentations can be found at this Napkin Folding Guide website.